Lush bath bombs and I go a long way back. I remember being excited as a kid about getting a Lush bath bomb. If my memory is correct, I remember that some of the first bath bombs that I tried were 'Ickle Baby' which is no longer available (but they do have 'Ickle Baby Bot') and the 'Titsy Totsy' bath bomb. 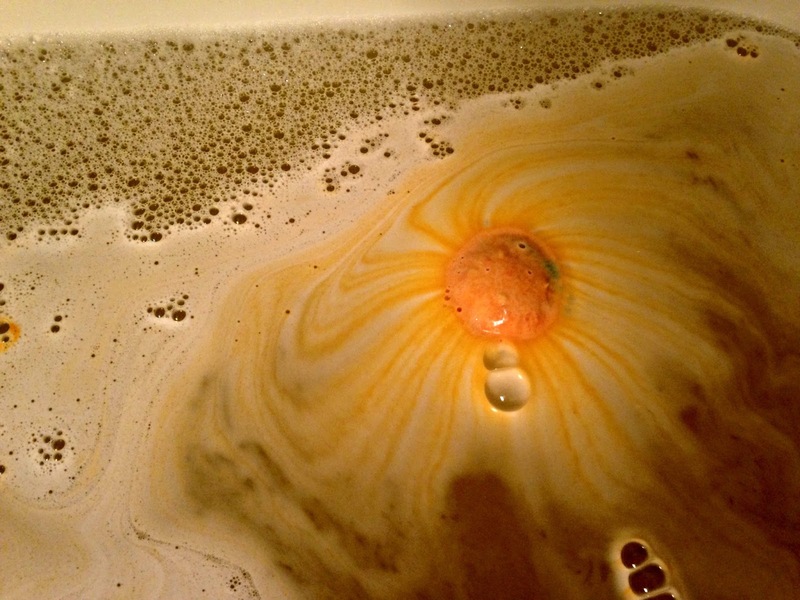 I recently went into Lush where I bought one of their new bath oils (you can read my thoughts here) and a bath bomb. I decided to go for a bath bomb that I haven't used before as I normally stick to the same ones so I picked the 'Yoga' bath bomb. Lush's website says: "We take bathtime seriously - seriously fun that is. Settle in for a good soak with an original Lush invention, exploding with essential oils, flower petals and tons of fizzy fun. Whether you're after a relaxing , petal-laden floral soak or an invigorating multilayered explosion of colour and scent, there's a bath bomb perfect for every bathing experience." The 'Yoga' bath bomb that I decided to try is described as: "Designed to be slow frothing, with a medative blend of colour and earthy, grounding oils, this bomb creates a sanctuary of calm in the tub. Drop this seemingly simple orange bomb into a warm bath and watch as it froths up in slow fizzing layers of mesmerising colour. Inhale the deeply relaxing scents of sandalwood, olibanum and ho wood oils and take a journey of the self." The 'Yoga' bomb is $8.95 so a little bit more than most of the other bath bombs but it is huge and slow frothing so it lasts longer. Sodium bicarbonate, citric acid, fragrance, cream of tartar , cassie absolute, olibanum oil, ho wood oil, sandalwood oil, water, sodium laureth sulfate, lauryl betaine, benzyl benzoate, euegonel, limonene, linalool, snowflake lustre; frosty Holly and gold shimmer lustre (potassium aluminium silicate, titanium dioxide, yellow 5, blue 1, synthetic fluorphlogomite, iron oxides, silica), red 28, blue 1, yellow 6. One of my favourite things about bath bombs is the colour that they turn the water. This bath bomb didn't disappoint. First it released orange, yellow and blue, it reminded me of a sunset and was really beautiful. As you can see in the image above of the full bomb, there are little gold specks of glitter. The glitter didn't bother me as I love it but just a heads-up in case you don't want to have to clean it from your bath after. It did leave my skin with a few specks of glitter but nothing over the top. I also found that out of all of the Lush bath bombs that I have used previously, this one created the most bubbles. A lot of the ones I have used before haven't created any but I think the 'Yoga' bomb does because it froths slower. Overall it took around 10 minutes for the full thing to disolve. I adored the scent of this product. I love the more earthy scents that Lush have been doing and sandalwood is one of my favourite smells. It smelt citrusy and earthy, in fact the smell reminded me a little of the much loved pumpkin spiced latte from Starbucks. It is a very relaxing scent and it definitely helped me to unwind. I would repurchase this bath bomb although I have so many others I want to try! 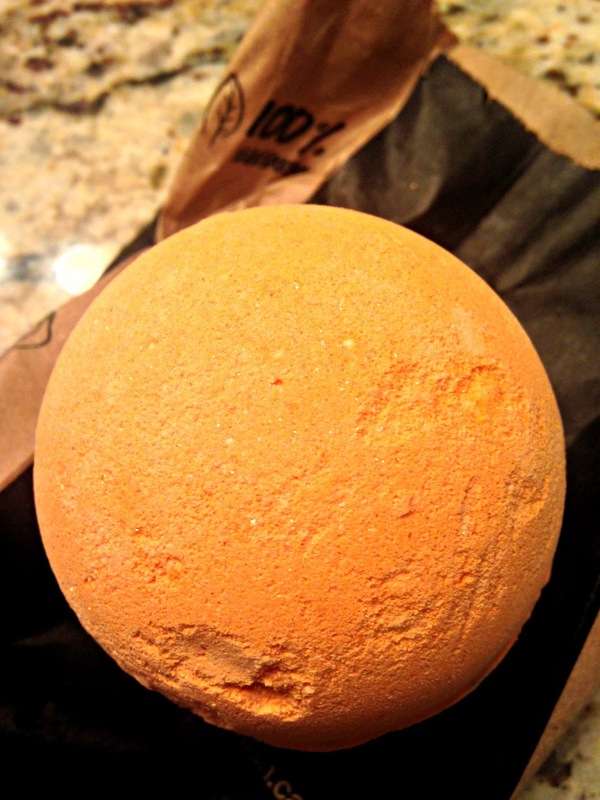 Have you tried the 'Yoga' bath bomb, what did you think of it? What is your favourite Lush product? 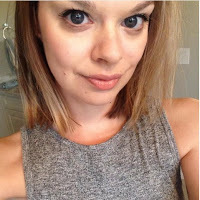 Follow me on Instagram, Pinterest, Facebook and Twitter!